As a hand quilter by preference, it is inevitable that I sew slowly. One of my quilts can take over a year to complete if it is particularly complex. The thrills of the quick make and the speedy finish are not for me. I have mountains of fabric I cannot possibly get through, unfinished quilts come in and out of favour, my sewing machines lie idle. And that is the way I like it. 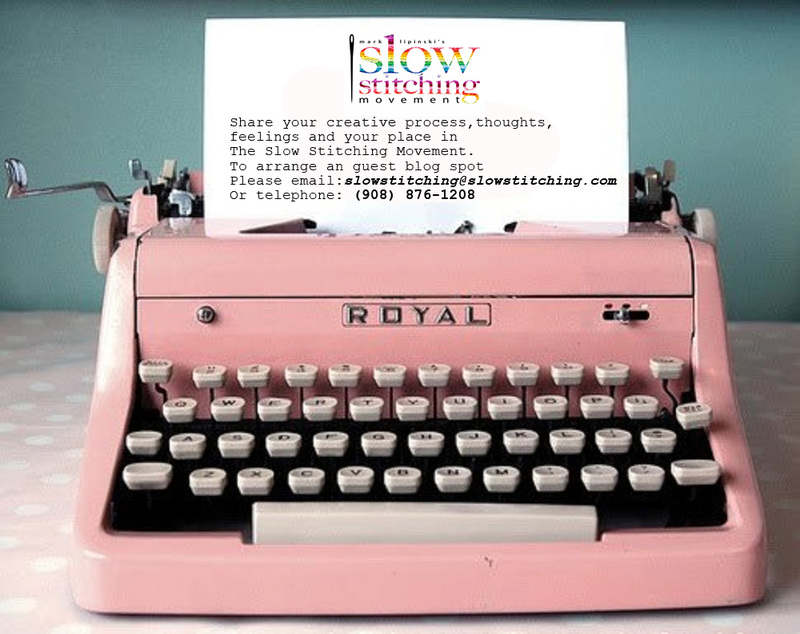 The Slow Stitching Movement is, therefore, a movement for me! It is just as well that I don’t mind being particularly quick to finish quilts. 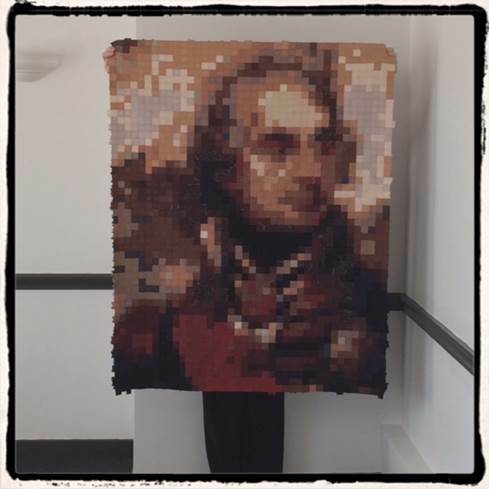 Just under a year ago, I started on my most ambitious project to date – a quilted representation of the British Naval hero Horatio Nelson, 1st Viscount Nelson, KB. 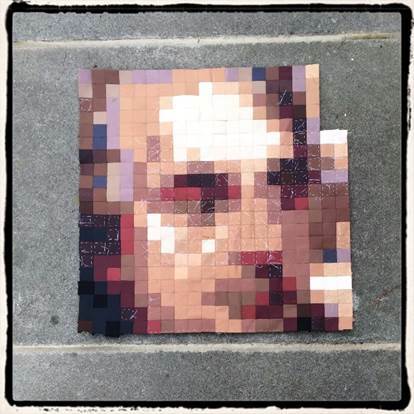 Based on a portrait of Nelson painted in 1800 by Sir William Beechey, the quilt comprises 3,200 one inch squares, all sewn by hand using the English Paper Piecing technique. A bizarre project? Well, possibly, but there is a reason for it that makes sense to me. When I am not sewing, I am writing a PhD thesis about the British film director, Maurice Elvey. Elvey had a long career, starting making films in 1913 during the silent days, making his transition to sound in 1929, and retiring in 1957. In 1918, Elvey made a biographical film about Nelson – a flawed film, but a very interesting one. I’ve spent a long time researching the background to the production of Nelson, and become increasingly fascinated by the film and Nelson’s place in British culture. 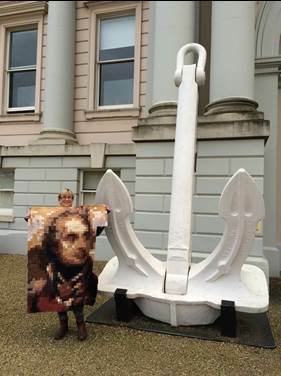 Nelson at 490 squares, August 2014. A face starting to emerge? One hot day last summer, while writing about some of the film scenes filmed on the Isle of Wight, I idly wondered whether it would be possible to make a quilted piece that complemented my film research. Before I had properly worked out the details, I found that I had ordered fabric and started cutting out one inch squares of spare paper: The Nelson Quilt was born. 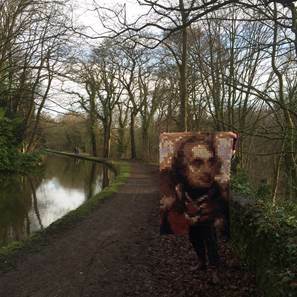 It is part of a long tradition of works inspired by Nelson. Starting with the Battle of the Nile, his victories and subsequent death at the Battle of Trafalgar resulted in a phenomenal amount of commemorative memorabilia – from plates, to cups, to busts, to wallpaper, to snuffboxes. There are sewn commemorative banners, and girls sewed samplers mourning Nelson’s death– the list is endless. So while writing about the film, I started to sew about it as well. Strange as it may seem, the slow stitching of the Nelson Quilt has enhanced my film research. I understand better why a film about Nelson was so important during the First World War and why he was promoted as a hero at a time of national emergency. I’ve visited film locations on the Isle of Wight and considered how certain shots were taken. 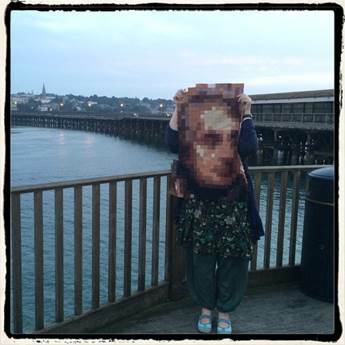 I’ve sewn squares of the quilt on long train journeys to Portsmouth where I stood on the deck of HMS Victory by the spot where Nelson fell and stooped to reach the Orlop Deck where he died. I’ve gone to see Nelson’s tomb in St Paul’s Cathedral in London and been unexpectedly moved. 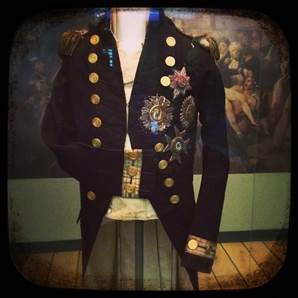 I’ve visited London’s National Maritime Museum in Greenwich and peered at the coat Nelson was wearing when he was shot – still a venerated object today. None of this would have happened without the quilt project; the Nelson film would just have been one of many I would have looked at for my thesis. Instead it has become one of the key areas of my research and I love it! Stitching on that quilt for so many hours has enhanced my research significantly. I was happily working on the writing and the quilting projects in tandem, each adding to the other. What could be better? Instead of enjoying the sewing, instead of watching each section grow and the portrait develop, I put myself in a totally artificial race against the clock. Must get him finished! Must get him finished! And one morning I woke up and couldn’t stretch my right arm. All that English Paper Piecing is hard on the hands and arms. I’d given myself a dose of lateral epicondylitis – more commonly known as Tennis Elbow, or as I have rechristened it, Nelson Elbow. Serves me right for losing sight of what was important – enjoying the sewing, reflecting on Nelson, thinking about my film research – and replacing those with a sense of grim determination. So the Nelson Quilt has sat idle for three weeks. My elbow is getting better and I think I’ll be able to pick up the project again fairly soon. If he isn’t finished in time for the conference it doesn’t really matter. The piece as it stands is pretty big and can be shown as it is. And my Nelson Elbow has really done me a favour by telling me: Don’t rush to finish. Remember to enjoy your sewing. Embrace the slowness of a transformative project. It will be so much more worthwhile in the end. 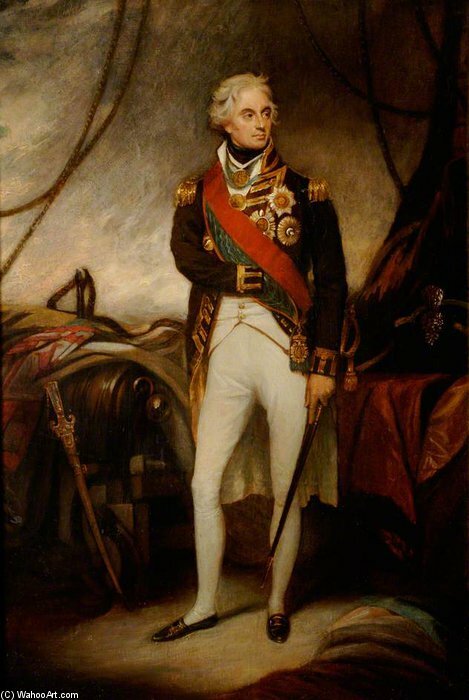 Horatio Nelson, 1st Viscount Nelson was a British flag officer in the Royal Navy. He was noted for his inspirational leadership and superb grasp of strategy and unconventional tactics, which resulted in a number of decisive naval victories, particularly during the Napoleonic Wars. He was wounded several times in combat, losing one arm in the unsuccessful attempt to conquer Santa Cruz de Tenerife and the sight in one eye in Corsica. He was shot and killed during his final victory at the Battle of Trafalgar in 1805. Lucie Dutton is a quilter and film researcher (with a particular interest in British silent cinema) who lives in London. She sews by hand rather than machine so Slow Stitching comes naturally. 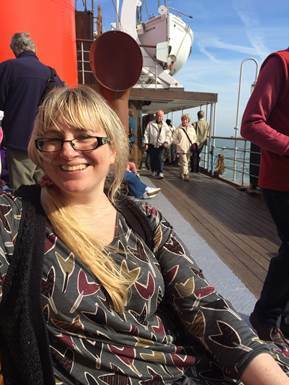 Lucie blogs about quilting, reading and the movies at www.isthereroomformetosew.com and tweets (mostly about silent film) at her main twitter account, which is @MissElvey, and less frequently (about sewing and quilting) at @TheSewingBea. Her Instagram is MissElvey. I’m delighted to be a guest blogger for slowstitching.com. Here is my post about the Nelson Quilt, silent film inspiration and not rushing to finish. 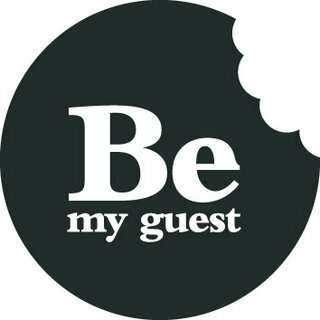 I emailed on April 15 about guest blogging and have not received any response. Do you have any interest in my participation? Thanks. That really is a lesson well learned Lucie and one I needed reminding of. Thanks for sharing Nelson with us! I enjoyed this piece very much, and the quilt is a marvel. I first became interested in Nelson when visiting Nelson Dockyard in Antigua, where he is still much revered. This is by far the most inspiration article I’ve read in ages. I recently started seminary and have been overwhelmed by the time requirements. Hearing Lucie’s journey of research mixed with quilting has given me an entirely new perspective on both this thing called RESEARCH and the slow stitch movement. I feel free to take my time and no longer strapped by this notion that I must have a Bernina or Janome to quilt anything. Who needs a sewing machine?? Not this girl! Thank you for this wonderful post! Blessings to each of you! I can’t tell you how excited and thrilled I was by this posting. I have been totally obsessed with a television show called Haven, and the resulting quilt. I am so glad that someone else channels an interest into a quilt. I know that as a quilter I get to see conventional and beautiful quilts but not ones so expressive about an atypical theme. I have made movie related quilts, one named Casablankie and another on the Maltese Falcon, but I love Japanese silent films and this insightful post makes me think there are some movies I want to work on. I get to go to a Mark Lipinski class in 2 weeks so I was looking for ideas. 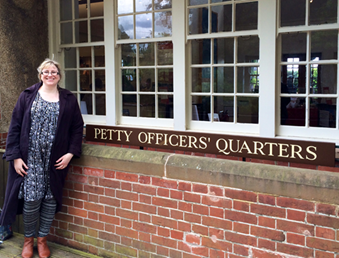 Great to stumble on this guest blog.